Curiosity is currently preparing to bump to her next drill site in the Pettegrove Point member, but not before gathering many observations at our current location. There are interesting color variations in today's workspace, with grey, tan, and red gradients across the outcrop that can be seen in the above image. Curiosity will document these color variations in detail with images from Mastcam and the Mars Hand Lens Imager (MAHLI) and chemical measurements from the ChemCam and Alpha Particle X-Ray Spectrometer (APXS) instruments. This is a lot of data to relay, but we expect downlinks from both the Mars Odyssey and the ExoMars Trace Gas Orbiter spacecrafts over the weekend. On Sol 2131, the geology theme group planned ChemCam measurements of the targets "Shiant Isles" and "Inchnadamph," which are grey-toned rocks. The observation on Inchnadamph is especially interesting because ChemCam will shoot two sets of 150 laser shots into the rock to see if there are chemical variations with depth. The APXS instrument will also make chemical measurements on a darker grey target "Mount Battock" and a lighter grey target "Scourie More," in addition to a red target "Dobbs Linn" which will be brushed beforehand with the Dust Removal Tool (DRT). All of these targets will be documented with high-resolution Mastcam and MAHLI images. On Sol 2132, Curiosity will acquire a Mastcam multispectral observation of all these targets to enable a detailed assessment of these color variations. Mastcam will also image the "Bullers of Buchan" target, which is an outcrop that may expose layering and nodules. 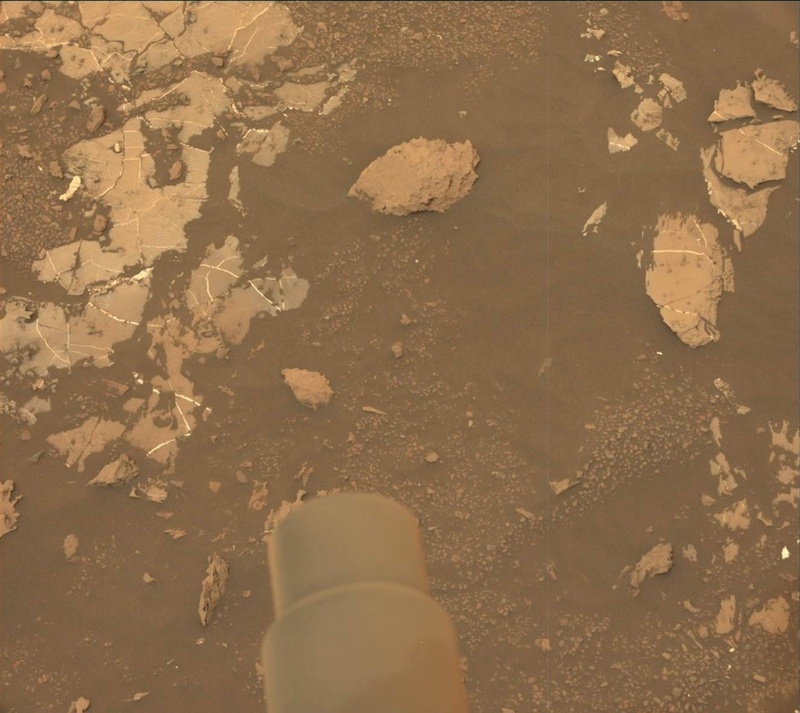 Curiosity will then drive a few meters to our drill site. Sol 2133 is packed with three science blocks filled with activities from the environmental theme group: Mastcam tau and crater rim extinction observations, Navcam zenith, suprahorizon, and dust devil movies, and Navcam line of sight observations. Curiosity will also make ChemCam passive measurements and an APXS atmospheric measurement. All of these observations will help with our ongoing monitoring of the atmosphere as the dust storm settles. After all of this, we look forward to seeing our drill workspace on Monday!